ROME (Reuters) - A planned Franco-Italian railway link is a waste of public money, Italy's transport ministry said on Tuesday in a report that will heighten tensions within the government and could further damage frayed ties with Paris. The Alpine rail line, which is backed by the ruling League party but fiercely opposed by its coalition partner the 5-Star Movement, has a price tag of more than 20 billion euros ($22.6 billion), Italy's transport ministry says. 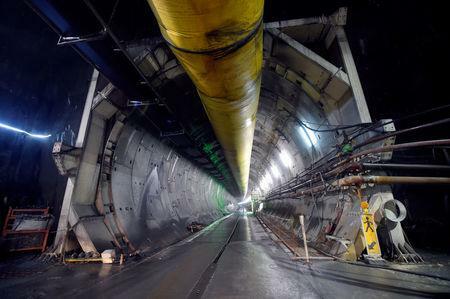 Work has already started on the most ambitious part of the project -- a 58km (36 mile) tunnel through the Alps -- with Italy, France and the European Union sharing the cost. Transport Minister Danilo Toninelli, a 5-Star politician, last year commissioned a panel of experts to draw up a cost-benefit analysis of the link and published the 79-page document on Tuesday. It estimated that the economic return would be a negative balance of between 7.0-7.8 billion euros ($7.9-$8.8 billion). Among a number of factors, he pointed to a drop in excise duty on petrol as freight is moved onto trains, as well. "As everyone can now see for themselves, the numbers of this economic and transport analysis are extremely negative," said Toninelli. "It is now up to the government to make a decision." The far-right League says the line connecting the French city of Lyon with Turin is vital to Italy's export-driven economy and suggested on Tuesday that it would not accept the ministry report at face value. "The cost-benefit analysis is not the bible," said Riccardo Molinari, the League leader in the lower house of parliament. "If we cannot find an accord, the final word should rest with the citizens (in a referendum)," he told Sky Italia television. The 5-Star Movement has said it will never sanction the project while it remains in power and, with support for the party falling in the polls, has hardened its stance in recent weeks as it struggles to shore up support. Opposition parties dismissed the report, saying its authors were biased against the project from the beginning. "It is like asking Dracula to guard over a bloodbank," said Sergio Chiamparino, the centre-left head of the northern Piedmont region that has most to gain from the rail link. Relations between Paris and Rome have deteriorated sharply this year and President Emmanuel Macron last week recalled France's ambassador to Rome after a war of words with both the League and 5-Star, which have accused Paris of undermining Italy's economic, foreign and migrant policies. French Transport Minister Elisabeth Borne issued a brief statement on Tuesday, saying she was reviewing the analysis. She added that France had always had "a constant position" on the project, suggesting that Paris was not about to change its mind. France and Italy are respectively each others' second-biggest trading partners and business leaders on both sides of the Alps say the TAV will facilitate commerce. Rome is also at loggerheads with the European Commission over its plans for an expansive 2019 budget. However, Toninelli said these disputes had no bearing on the TAV analysis.